A brand-new reader for the 100th anniversary of the sinking of the Titanic. On April 10, 1912, the TITANIC set sail. On April 15, 1912, the great ship sank. 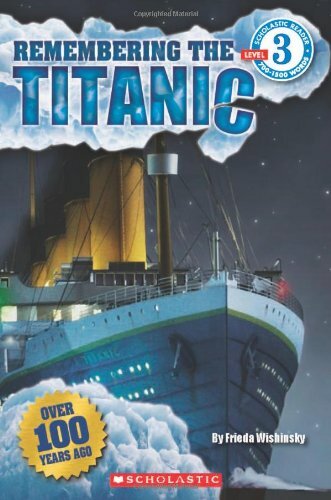 This simple reader tells the story of the TITANIC for the 100th anniversary of its tragic voyage. Find out what life was like aboard the ship and meet some of the passengers and the crew. Read about Robert Ballard's triumphant discovery of the wreck 73 years later and what's been discovered since. Full-color photographs throughout and clearly leveled text make history come alive for younger readers. Frieda Wishinsky has written many books for children, including Everything but the Kitchen Sink. She lives in Toronto, Canada but you can visit her at www.friedawishinsky.com.